Sometimes it takes years of reading to see the words. Even though the story is familiar and I’ve read the book, it was very moving to see this a couple of days ago. In the middle of preparation for a Bible Study I usually do not teach, I noticed these words for the first time. Think about it. The son has wished his father dead by asking for his inheritance early, taken off with it and spent it on prostitutes. We can only assume he was not buying them dinner and a cup of coffee. He then runs out of money and finds himself in the midst of pigs – the definitive symbol for being unclean, inside and out, for a Jew. So he decides he would be better off as a servant of his father than in such a shameful position. With humility he heads back and his father sees him coming from a long way off (not insignificant in and of itself). And the father felt compassion for him. You don’t feel compassion for people who are not hurting. Compassion is reserved for the hurting. You don’t feel compassion for someone with a new car. You feel compassion for those who just wrecked their car. Actually you are not as likely to feel compassion for them if they wrecked their car because they were drinking. The hurt has to be through no fault of their own. To have compassion is to come alongside the hurting and hurt because of their hurt. The father feels compassion for the pain of the son – the son who wished him dead and squandered his money on prostitutes and now comes back to where he should have been glad to stay. Phillip Yancey once wrote that we live in a world of “un-grace.” That statement has stuck with me for over a decade. It’s true. I’m a parent and the compassion of this father is still shocking to me. Heroic but shocking. The compassion of the Father for sinners who are hurting as a result of their sin is a shot across the bow of this world and all it’s un-grace. Last Night I pulled a camp chair into the front walk, which winds its way to wooden steps climbing towards the front door. An imperceptible breeze moved the Alabama air from the south. Facing in that direction I maneuvered my body in my seat so the smoke would pass behind me. I looked into the night sky. Pin pricks of starlight showcased themselves to the east over the valley below, with its lights ushering a haze of of gray from below. To the right, right over Montgomery sat the moon, a brilliant gash in the night. It hung just beyond the bare limbs of the copse which stood in front of me and between us and our neighbors to the south. The surrounding mid-October coolness of the hometown’s evening can never be got over. The sounds of bugs not yet driven away by the chill, a frog and a dog barking incessantly but mercifully in the distance fight for prominence over the slight rumble of occasional cars driving east and west on Savoy. In the valley to the west, a train whistle sounds, it’s roar across the tracks in the shadow of the bluff sounds for a few moments then disappears into the distance. Looking over the roof of our home and the wood beams which stretch into the entry and over the kitchen and outside over the back deck, the stars grew in number. Flying among them, planes at various levels, glided to destinations unknown. Time was unknown. And all of it had the distinct feel of being and blood-bought. Last night I saw Dylan in concert. It was surreal. Incredible to be in the same room with him, the living legend, it actually had the aura of just being in the room with a working band. A working band from about 50 years ago. I suppose it is strange the thing I liked best about the night was how uneventful it was. It was just a bunch of guys playing music with cords everywhere. What added to this was how Dylan changed almost every tune, some were almost completely unrecognizable till the title of the chorus was sung. I caught about fifty percent of the lyrics. 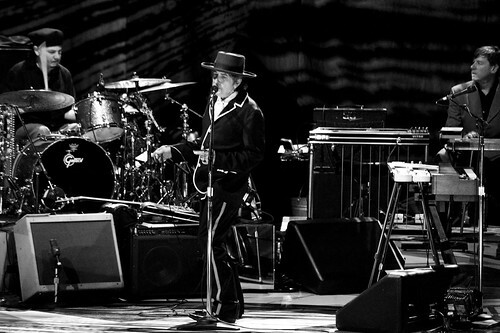 Highlights include “Cold Irons Bound,” “Ballad of a Thin Man,” “Jolene” and “Like A Rolling Stone.” I told my wife I might have enjoyed “Jolene” the most because none of the people around us knew the new song, so they were not yelling ‘woohoo!’ drunkenly every time he got to the chorus. Low points included the lady behind me, who throughout the majority of the concert did a loud and rather annoying impression of – and I am not kidding – Speedy Gonzales. I am not kidding. We moved after a while. I loved it. The musicianship was stellar. Dylan was great on keys, guitar and harmonica. Charlie Sexton, plating lead guitar put on a show. Bobby may be approaching 70, but it was loud, often rollicking and definitely worth the wait after all these years. When I decided to take an extended break from social media, I knew there would some lessons learned. Whenever something which is such a part of your daily life is removed, a real detox that has to take place. And in the midst of the cleansing, you see spaces, once covered by the dust of neglect, for what they are. I am constantly running status updates and tweets through my head. Some are clever. Some are meant to be profound and some funny. It’s a totally new phenomenon. Previous to joining facebook 4 years ago, there was no such outlet and therefore no need for these brief expressions to escape. But now? It’s constant. And I admit I do miss it all just a little. I miss reading other people’s status’ and seeing what all is going on. I miss the interaction. A little. But now there is an alternate new “thing” I would have never expected. I knew the desire to update facebook and Twitter would be a strong one. But this new strange enjoyment has caught me by surprise. This enjoyment is in keeping it all to myself. So here is how it all unwinds. Something happens, either externally or internally. The habitual, reflexive need to tell it to everyone in social media wells up from within. Then I remember, “I am not doing this.” And from somewhere comes this satisfying feeling of keeping the thought to myself. Not every time, do I feel this way. But it has happened enough. I wondered if it was hoarding, the first time I took notice of the joy I was feeling. But no, it feels more like taking care of something precious. Actually this has the ring of – now don’t anyone get their feelings hurt – of throwing my pearls before swine. It’s not that my friends on facebook and my followers on twitter are “swine” in the negative sense of the word. They just cannot appreciate the value some these thoughts have for me. Thoughts which social media have told me should be shared with anyone and everyone at all times. Before the social media revolution, this idea of our thoughts being as valuable as pearls, would have made sense. But now? It’s constant. And contrary to the urge to post something, which is dark and constricting, keeping it all to myself has the feel of being open and airy. OK, I know that sounds bizarre. But I cannot put it in words. Perhaps I should have just kept that last part to myself. I’m breaking up with Twitter and facebook. There is no one reason for this. There are a number of little shard-like reasons. All little to nothing by themselves. But in the aggregate, enough discomfort to walk away. I got tired of the silliness of always feeling like I needed to check facebook and twitter. The noise was crowding out any possibility for silence. Every clever thought was immediately followed by the need to post it. And often the clever thought was born out of the need to post something. Anything. The tail was wagging the dog. On facebook I had hidden almost every pastor. On Twitter they were not in my reading list. They were mostly quote machines, or pithy statement-makers – as spiritual as Jesus and certainly more clever. I was tired of feeling too cool to comment and respond. And then I would wonder if that was the reason someone did not respond or comment on what I said. I got tired of people just making up new requirements for pastors. I got real tired of wanting to tell people what I think they should do. And I got tired of wanting to attack so much of what was above. I got tired of being tired of it all. So I’m quitting for at least a month. Maybe forever. Does anyone ever stop and just think anymore? Without guilt? Usually we fill up our time with some form of entertainment or work or social activity. All good things. But thinking alone seems to be at a premium. I have so few times of sitting and thinking in my life. The portability of my music collection, my iPhone and my computer make me always accessible and everyone else is also. Movies are so easy to get at, what with Netflix and Hulu. My parents used to have to wait till the weekends to watch a movie. What did they do in the meantime? So on Saturday, full-hearted from the night before’s lack of events, I deleted facebook and Twitter from my iPhone. For two and a half years facebook has been accessible wherever I am. But I took it and Twitter and thrust it into the nether regions of cyberspace…as far as I was concerned at least. Thankfully I was able to find out this was a common enough occurrence and I was able to find a solution. But for about an hour I was entertaining the reality of having no iPhone. We are not sure how we will be able to buy Christmas presents for our kids so the idea of shelling out money for a new iPhone was preposterous. I had often said I would never be able to go back to a normal cell phone. Now I am not so sure I can say that with such confidence. I’m not even sure I want the phone I have anymore. There is so much to think about and all the while I’ve been filling that space with social media and digital information. God, grace, family, law, beauty, friends, love, creation, indoor-plumbing, the cross, gravity, food, music and death; all worth my thoughts in the silent moments between the noise of life. Those times have always been there but before they were frustrating and boring; times to be got over and gotten through. I want to think differently. So I’m breaking up with Twitter and facebook. Both accounts will be around for awhile. They will both still be used for publishing. But that could change at any time. There are “difficulties”that will come with this decision. I won’t be able to keep up with many people like before. I will miss out on news stories, music recommendations and the little details of people’s lives which made social media so enjoyable. But I am willing to look into paying that price. I like what I can do with social media, the internet and my iPhone. I’m just not sure what all it’s doing to me. I’m still pretty mad about the way Matt Damon treated Minnie Driver in Good Will Hunting. My wife was down at the family farm with the kids and I was home by myself. So I watched it this past weekend. Don’t tell my wife but I kinda have a crush on Minnie Driver in that movie. Did have a crush. Well, do. So I’m mad at Matt Damon. A couple of hours previous to watching this movie for at least the third time, I signed off of facebook and Twitter for an indefinite period. I wanted a little time away. And this decision was with me constantly while I was watching the film because the temptation to tweet the great lines were legion. And then I noticed something in the film I had not noticed before. The scene that draws everyone in to the story is the chalkboard scene. When Will does the problem on the chalkboard out in the hall of the math building, it is obvious someone of genius does it, though at first no one knows who it is. There are no thoughts of a student faking it by using the internet. Why? It was 1997. So, we are talking pre-wikipedia or anything of the sort. Sure, there were internet sites in 1997 but they had blue backgrounds with yellow and red writing. Today most people would just assume whoever solved the problem got help from the internet. The plethora of information would have rendered us more than a little cynical about the beauty of someone like Will’s genius. We would simply assume his information was borrowed and not really his own. And we would do this because so much of our information is. We either know too much or we know too little. Maybe both. But while the math professor knew that there was someone who could authentically prove the theorem, we now wonder at the possibility of authenticity at all. The prodigious abilities of Will Hunting stood in stark relief to the meager resources at his disposal, proving his authenticity. I wonder if we have the opposite problem. I wonder if we have resources so very instantly at our fingertips…in our pockets, abilities are no longer really needed and the wonder of greatness is never really seen. We have no need any longer to sit and wonder. There are no long drives to the library to see if they have a book that might help us think through issues in a particular discipline of study. There is no scanning of the shelves while the quiet of the room full of books begs us to continue on our quest for an answer. And once we find that book, there are no time periods of looking for the information, possibly writing it down and taking it in as we do. Now we hit ‘enter’ and we ‘cut and paste’ and think we have done something. We have more information but we do not know it. Admittedly, I actually got nostalgic for that once upon a time when the internet did not dominate our life. It was a moment. An “aorist” kind of moment. The kind of moment with continuing effects stretching into and doing violence to other moments, changing them. I thought for a moment about how my kids will never know a time without the internet and therefore never really understand what it is. I argued with myself for a moment. And all my arguments for the net’s necessity rung hollow across the landscape of history. The tinny arguments could only reach back to a period not long ago, say….around 1997.